Prototype: German Federal Railroad (DB) and German Sleeping and Dining Car Company (DSG) Era III streamlined express train passenger cars ("Schürzenwagen"). One type Pw4üse-38/52/59 express train baggage car, one type AB4üwe-39/54 coach, 1st/2nd class, and two type WL4ü[e] sleeping cars. Used in train D 475 that ran in the summer schedule of 1962 between Basle and Westerland (Sylt). Car routing from Frankfurt (Main) via Hannover and Hamburg Altona to Westerland. Model: The cars have factory-installed LED interior lighting. They also have separable, current-conducting couplers. A pickup shoe is mounted on one car. All of the cars have Görlitz design trucks. The cars have diaphragms and rubber corridor connections at the ends. A retracted diaphragm is included for the end of the train. Total length over the buffers 103.5 cm / 40-3/4". These cars were used in the summer schedule for 1962 in train D 475. Train D 475 ran at least on a partial route (Hamburg Altona - Westerland) with German design three sleeping cars. 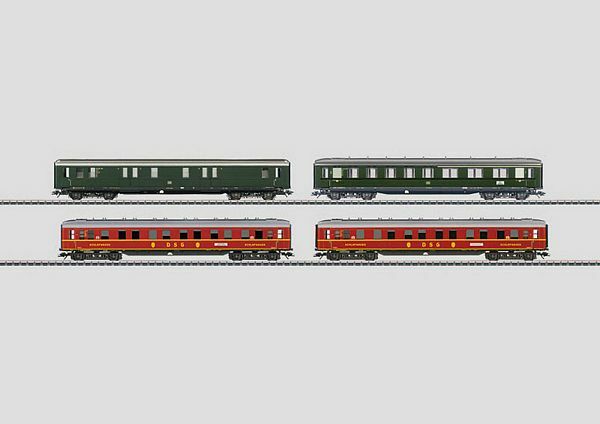 Train D 475 can be modelled with this car set together with the Marklin 43252 sleeping car from the Marklin H0 assortment.